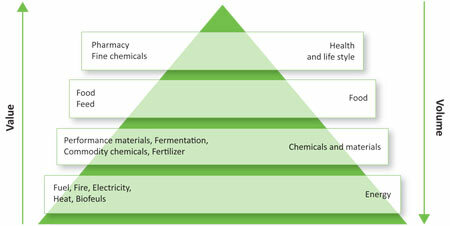 The bio-based economy’s value pyramid indicates that biomass value is determined by its application. In a proper functioning market, the value and price of biomass will be reflected by its application value. After refinery, each individual component will have its own application and economic value. As a result, biomass can obtain a higher economic value than without such separation options. 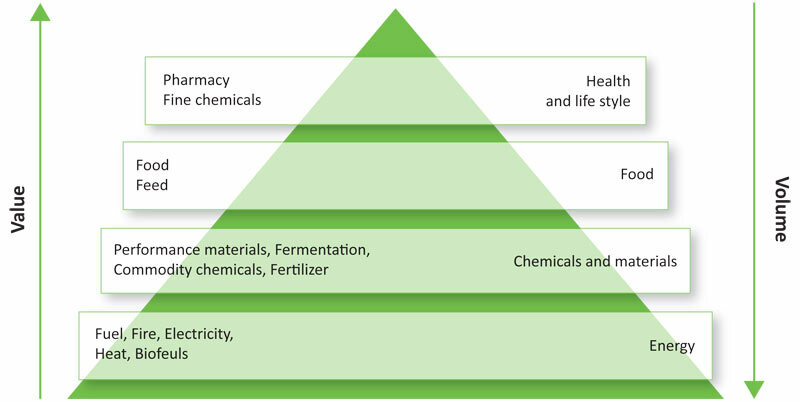 Bio-refinery focussed on optimal value utilization means that you first isolate those substances or materials that can be used in high quality products and that have higher values. Residues can be used for application in products with a (presumably) lower value than, such as feedstock or production of second-generation biofuels for road-transport, marine ore aviation. Remaining residues than can be converted into energy, in particular electricity. The sum of the highest possible economic values of all the various components of biomass, make that biomass as a product can have a higher value for the producers than if the entire product is used only for production of electricity or heat.